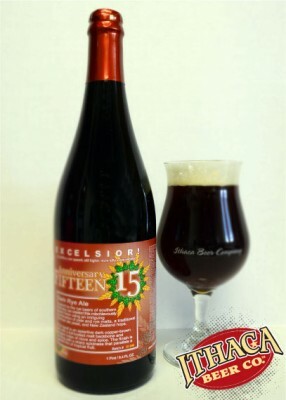 Ithaca Beer is excited to announce the release of highly anticipated Excelsior! Anniversary Fifteen, and also the long-awaited return of Excelsior! Old Habit on Thursday, May 16, 2013 (starting at noon). These releases are well-timed in conjunction with American Craft Beer Week (May 13-19), and the first Excelsior! releases from Ithaca Beer’s brand new brewery. When doors open at noon in the Taproom at Ithaca Beer, IBC will be ready to sell bottles of both Fifteen and Old Habit as well as growler fills of Fifteen at the bar. Later that evening around 5PM, Ithaca Beer will continue its week-long cask-night celebration of American Craft Beer Week with cask ale prepared by other local breweries and Ithaca Beer. Inspired by the rye beers of southern Germany, we created this mischievously potent brew using an intriguing combination of pale and rye malts, a traditional German ale yeast, and New Zealand hops. The result is an assertive dark copper-brown ale with a full-bodied malt backbone and elegant notes of clove and spice. The finish is bracing with a sharp spiciness that parallels a gentle hint of tropical fruit. Fifteen will be available for bottle purchase and growler fills in the Taproom. A robust American ale brewed with four different rye malts and fresh centennial and crystal hops. It is partly fermented in Kentucky Rye Whiskey barrels then carefully blended. Enjoy the gorgeous ruby color, strong aromas of vanilla and black cherry, earthy flavors of nuts, oak and the warm, spicy finish. Pairs with: steak or burgers, desserts like bread pudding, or mellow soft cheese like butterkäse or smoked mozzarella. Old Habit will be available for bottle purchase only in the Taproom. Limit 3 bottles per customer.